Silent Night, written on Christmas Eve in a small town in Austria nearly two centuries ago, is one of the world's most beloved Christmas carols. Maja Dusikova captures the song's simplicity and grace in warm, reverent pictures that illustrate the joy and wonder experienced around the world at the birth of the Christ Child. The result is a picture book Nativity that echoes the universal appeal of Silent Night. Start reading Silent Night, Holy Night on your Kindle in under a minute. Great book but the batteries were dead. Had to spend $12 on replacement batteries. 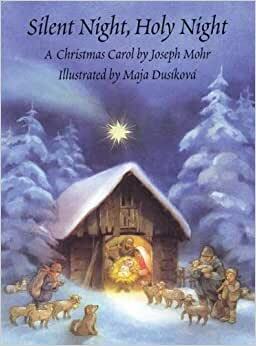 I use this book to teach little ones how to sing Silent Night, but I gave this one as a baby gift at Christmas time. Very beautiful, sweet illustrations. The illustrations are very nice, but the music quality was disappointing. It had a tinny sound that ruined the melody. The book was in good shape however it was not what I ordered. I ordered the book with a music chip and it did not include one. I didn't want to waste any more time in returning it and getting my money back so i kept it.